VROC RAID will only come bundled with new motherboards or with new Intel SSDs. After months of waiting and speculation, Intel on Monday finally clarified just how its highly controversial RAID system, VROC, will roll out. VROC, which debuted at Computex and stands for Virtual RAID on CPU, lets you connect multiple NVMe PCIe SSDs directly to your CPU in a bootable RAID partition. In other words, you can get massive amounts of storage and smoking transfer speeds. But there are a few catches. VROC works only with Intel SSDs, and only with Skylake-X. Plus, if you want VROC you need to buy a special dongle to enable the feature on your motherboard. On Monday, Intel added another twist. The company told PCWorld that VROC keys will be available in only two ways: bundled with new X299 motherboards or bundled with Intel SSDs. That's right: Individual keys to enable VROC will not be sold directly to consumers. However, Intel said it's leaving it up to board and system vendors to decide what to do for those who already purchased X299 motherboards and systems based on the upcoming feature. Intel declined to release final pricing for the VROC key, because the key won't be sold apart from a bundle. With all these conditions attached to VROC, it's not surprising that its Computex debut fell a little flat. When Core i9 was released a month later, Intel was radio-silent on VROC. 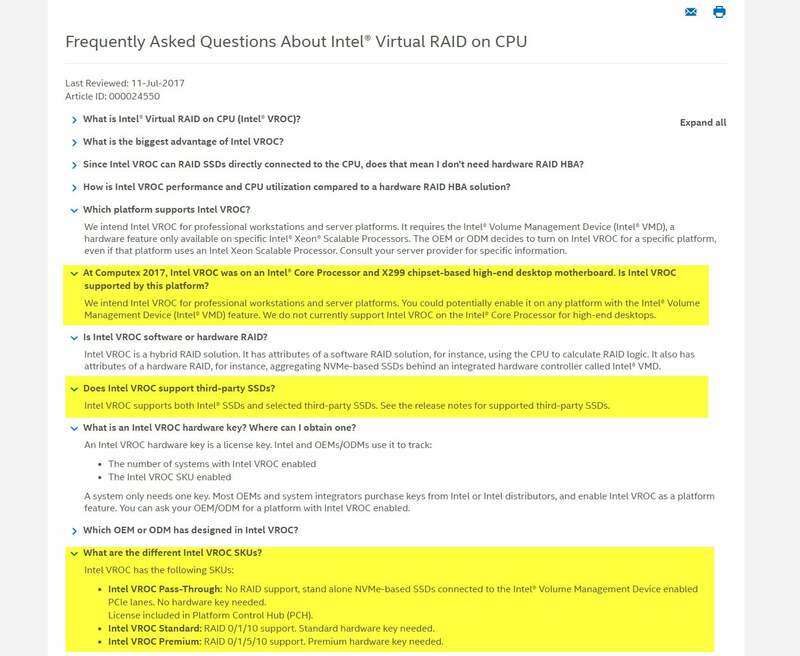 An official FAQ by the company even said VROC was only supported on Xeon and not Core i7 CPUs, leading many to fret that VROC would receive an early burial. An Intel FAQ that shuffled VROC to the Xeon platform, and Intel's radio silence on VROC around its Core i9 news, made many wonder whether VROC had been nixed. One welcome change is the elimination of the most controversial aspect: a proposed sliding cost scale. At Computex, motherboard vendors said VROC prices would likely vary, with RAID 0 going for $99 and RAID 5 costing $150. That alone caused a massive groan across the Internet. 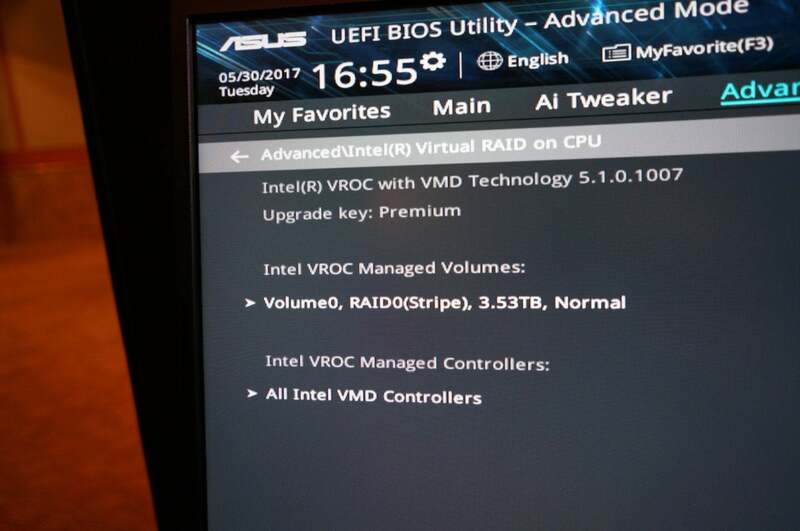 Intel now says any VROC key will enable RAID 0, 1, 5 and 10 modes on the X299 platform. There's still plenty to complain about, though. Intel confirmed that the consumer version of VROC will still only work with Intel SSDs. It's not clear whether trying different brands of SSD would be impossible, risky, or just undesirable (in Intel's eyes). All Intel officials would say is that only Intel drives would be validated. Also not clear is how many devices VROC will support in its final consumer trim. As presented at Computex, VROC could RAID up to 20 devices in PCIe, but Intel didn't disclose how many drives it will support when finally released. Don't worry, Internet, there's more for you to be angry about. VROC will still only function with Skylake-X Cdore i9 and Core i7 CPUs, leaving Core i7 and Core i5 Kaby Lake X users in the cold. The ultimate burn came from AMD a few weeks ago: The company released its own ability to run NVMe RAID directly off of the CPU—for free.